Phil lives in a cozy town in Northampton UK and works as a web developer under the name of Wheredidthetigergo. 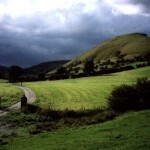 When he’s not busy working, he likes to get outdoors and walk/hike around the beautiful English countryside. He regularly walks for charity groups. On one such occasion, while walking in the aid of MS society, he decided to setup a website which would allow sponsors, family and friends to track their location and see updates via Twitter and Flickr on the go. 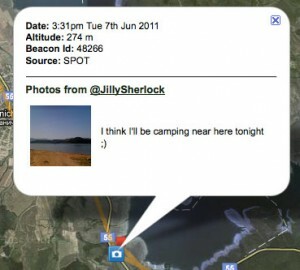 It turned out that this social mash up of GEO tracking and live blogging was a big hit. Numerous people including @PhilOutdoors suggested he build this as a site using ViewRanger and its service called BuddyBeacon for anyone to use. Being the nice guy that Phil is, he went along with the idea of sharing his quirky genius add on for the public to use. When Phil first put up Social Hiking, it was a basic website page set up to test the waters. As it turns out, people form all over the world became interested in tracking their adventures live and socially for either their own use, to share with family & friends or even the whole world. I don’t think Phil ever expected this type of reaction, at least not on this scale. This quiet country gentleman suddenly found himself in a mosh pit of followers excited and eager to use his invention. Astounded, but obviously happy with the response from fellow outdoor enthusiasts, Phil realized that in order to support the supporters he had to take the next steps for social hiking. 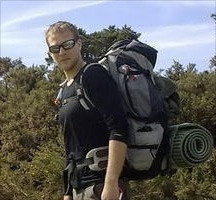 He spent some time developing the social hiking website, improving the product and overall brand. Today, you have a FREE, fully functioning, live, social, GEO-tracking and live blogging site which we know and love as being the Social Hiking site. I asked Phil if he was happy with the Social Hiking website. He said he was overjoyed on how fast the following is growing and how he never expected it to be so successful, all on its own terms and time. He would love to add more features to the site, such as Facebook integration, create user bios, profiles, as well as implement a more active and user friendly community – to only name a few. The only problem Phil says, is time. He told me, if he could work day and night solely on Social Hiking, he would be a happy man. Unfortunately, keeping on top of his REAL work “sometimes” takes priority. Phil hopes to have more time to work on Social Hiking this summer in order move the site forward in a big way. 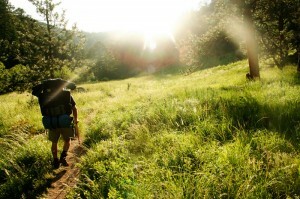 As I browsed the Social Hiking site I could see the potential in this product and site. Within a few months of being launched it already has hundreds of active users! From day walkers, hikers, charity groups, cyclists, RV’ers, and world roamers, it seems this site could be used in an unlimited number of ways. Being a world traveler, I asked him if he would ever cater to the backpacking traveler community. 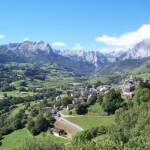 Phil was pleased to hear my interest and admiration for his site and did not dismiss the idea of exposing social hiking to a whole array of various types of travel from all over the world. He mentioned it was definitely something to think about. I personally think the idea of social hiking used for a world traveler to track where they are and keep connected to their friends and family along the way would be an excellent thing to have. I shared with him my thoughts of how I could see the site expanding internationally to many levels of travel. He also agreed that it would be great if one day Social Hiking could be made into an App for smartphones. That way anyone and everyone could download it for whatever means they use it for. 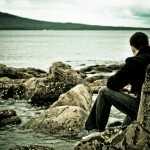 It all boils down to the time I have available to work on it – he said chuckling. Phil hopes that in the next year he would like to see the site “rocket”, and so would I. I mentioned to him that the site was becoming something like a soap opera you watch on TV. 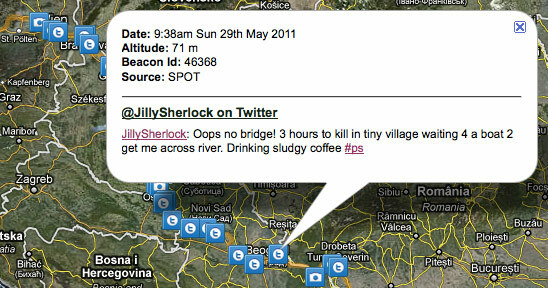 I was already hooked on watching Jilly’s cycle across to Eastern Europe via the Social Hiking site. Watching her progress each day and reading her live tweets from whatever small foreign town she was in. She also posted some amazing photos on Flickr via social hiking. Like I said, very addicting stuff. It also makes me want to get out and travel, hike or cycle. 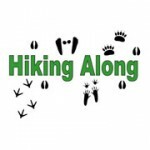 I mentioned to Phil that I could see this being a big hit with the younger generations as you are now adding a social aspect to hiking which was not there before. We all know, that in today’s day and age, tweeting and sharing your every move with everyone else is quite the trendy fashion. As it would seem, the sky is the limit for Phil’s “Social Hiking”. I, like many others, am very happy he did decide to develop and kindly share it for everyone to use. We hope Phil will find the time in his busy work schedule to keep working on Social Hiking and create an ultimate social GEO-blogging tool so that we can share our outdoor adventures with EVERYONE! Get the ViewRanger app in order for Social Hiking to track your location. ViewRanger is available for iPhone , most Symbian devices and Android phones. Once ViewRanger is setup, simply go to the ViewRanger Portal and setup BuddyBeacon. Edit the BuddyBeacon settings on your phone to “Send Old Positions” and choose a four digit pin. Get out there and watch your friends and family join you along the way. Find out more on how to get started. It’s very easy and especially great because Phil will personally help you set it up, use it and ensure it is working smoothly – now that is customer service, what a great guy! No responses to "Getting Social with Social Hiking"